Hola kitties! It's Music Monday time again. It's been a hectic weekend what with the peeps shopping and not playing with The Cat. Pop is on staycation this week and I hope to get lots of Pop time. Can you tell I'm talking guitars today? Actually the guitar in the image isn't the one I'm talking about but I'm allowed poetic license on this here blog. BTW, thanks for all the nice words about last week's Music Moves Me unusual rock and rap pairings selections. 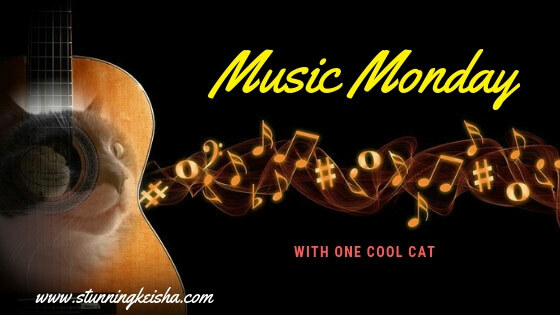 I'm participating in this week's Music Moves Me blog hop co-hosted by Curious as a Cathy. Themes this month were picked by Kim from The ReInVintaged Life. This week's prompt is "Songs where a particular instrument has moved you" whether it's a favorite vocal sound, bass line, drumming/beats, piano, guitar solo etc. At first I didn't know what to make of this but figured I'd do my take on it. At the beginning of time, TW listened to female vocalists after all she had four years of professional voice lessons. As time wore on, she grooved to bands with cool guitar sounds and riffs. With the exception of those amazing chords that open Bruce Springsteen's "Born to Run," she discovered that most of her favorite bands and musicians played Rickenbacker guitars, which have a distinctive jangly sound that makes us smile. John Lennon played a Rickenbacker on the early Beatles' records, which led to many of the other Brititsh invasion bands incorporating that instrument into their sound: the Dave Clark 5, Gerry & the Pacemakers, Hermans Hermits, the Hollies and the Searchers for a start. Of course others played it before Lennon but none got as much attention. Roger McGuinn and the Byrds personified the chiming Rickenbacker sound as much as the Beatles. "Mr. Tambourine Man" was TW's favorite song to sing. She doesn't remember what she ate for breakfast but still knows every single word of the extended version. Another American band who employed the sound in the 60s was Creedence Clearwater Revival. The sound died out when the guitar gods of metal wielded their powerful axes until 1984 when Peter Buck of R.E.M. made the Rickenbacker cool again. After R.E.M., you could hear it in the sounds of U2, the Smiths, Long Ryders, Smithereens, Bangles, the Church, Radiohead, Coldplay and many others. TW was at the Boston show where this pic was taken; in fact, she's hidden behind Buck as she was next to the couple to the left in the pic, right up against the stage. The audio is from a different Boston show at the Paradise. Go figure. Rain Parade from California sounded like a cross between the Byrds and R.E.M. When Pop played them on his radio show, he'd get calls telling him to play the real Byrds not these "imposters." MOL! I've played each so don't shoot me. Speaking of guitars, NYC's Metropolitan Museum of Art is featuring an exhibit called Play It Loud, Instruments of Rock and Roll now through October 1. TW is looking forward to getting up close to some wonderful rock memorabilia like the setup the Beatles used on Ed Sullivan, what's left of the guitar Hendrix destroyed at Monterey, Prince's Love Symbol guitar and lots more. There's even a Rickenbacker! 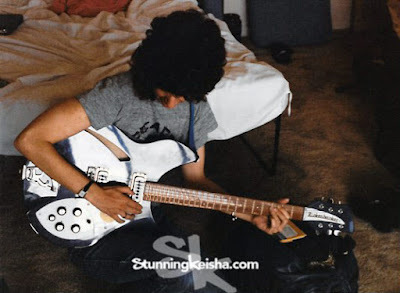 Bonus pic: Guess who this is, kitties, with a Rickenbacker? Why it's a much younger (and thinner) The Woman with that big '80s hair trying her friend's guitar on for size. She's so NOT cool. Gratuitous foto of the cool cat. This is the image from the lead graphic. In the mid-1980s, my human saw a lot of the guitarist from the Textones, and he often played a Rickenbacker. Funny enough, he played like Keith Richards, who is more known for using Telecasters. Cool post CK! The Dad has lots of guitars but always wanted a Rickenbacker! I almost bought a Rickenbacker years ago, but I changed my mind. Cool videos today. Great videos. Some go way, way back. What a good looking cool cat too. Great choices, and thanks for the heads up, I may have to plan a visit to the museum. W think TW AND the Cat are cool!! No more guitars in our house are allowed - although we don't have a Rickenbacker ... hmmmm. 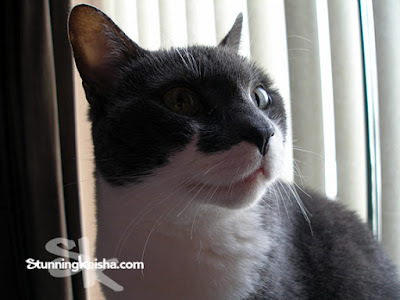 Love that picture CK, you are such a great model! I absolutely love the memories and history you have with your favorite band. I would give up a body part to have just one of those moments with mine. I've heard the first two before, but the last one REM nope can't say I've ever heard that one before. Hubby is a guitarist, but he says he's never heard some of these. Oh well, I think their cool choices. Have a great day! The mom actually knows what a Rickenbacker guitar is! The dad has a bunch of guitars...but alas, not one Rickenbacker. We'll party with you anytime, CK! We can always count on good music! Great choices for tunes as always, CK! It was cool to see TW with that guitar, too. I don't know, but TW looks pretty cool to me!! Cool facts about the Rickenbacker that I never heard about before. When you first mentioned the Beatles' "Ticket to Ride", I could imagine the Rickenbacker sound in my head because it is prominent in that song.